Appomattox Court House National Historical Park in Virginia covers 1700 acres, but the part with the tourist attractions is a much more manageable area. What was once the village of Appomattox Court House is about one square mile and contains a dozen historic buildings, open to view. Most of the buildings are restored originals. A reenactment of the surrender signing on April 9th had drawn thousands (a local newspaper article said 7000) of visitors to the park. It wasn’t the tens of thousands who showed up at Gettysburg for the 150th of its battle, but it was enough that there were long lines to visit every house and exhibit building. We generally don’t do lines, so opted to leave after the reenactment and return to Appomattox the following day, to see the sites. We hoped that the threats of thunderstorms would thin the herd. It did. 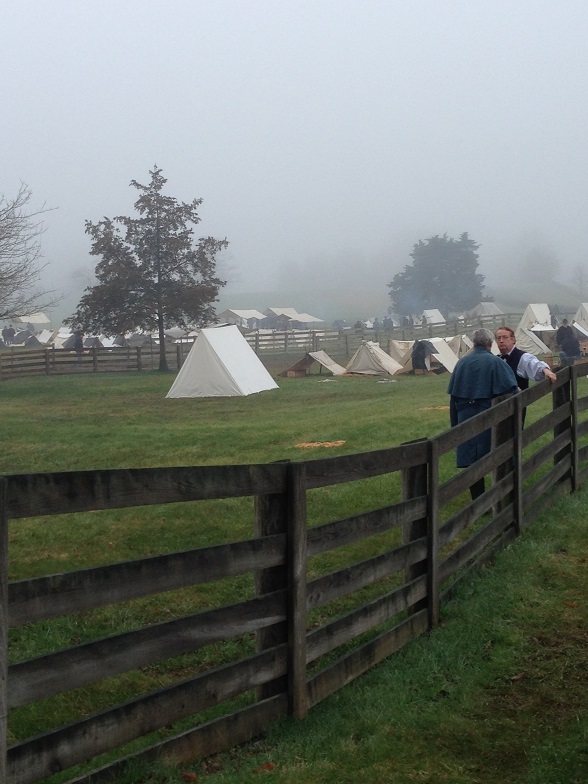 It had rained heavily the night before – I felt for the reenactors who were camped on site – and the morning bought a heavy fog. It made the village look like Brigadoon, rising from the mist. Or a scene from a Cold Mountain. 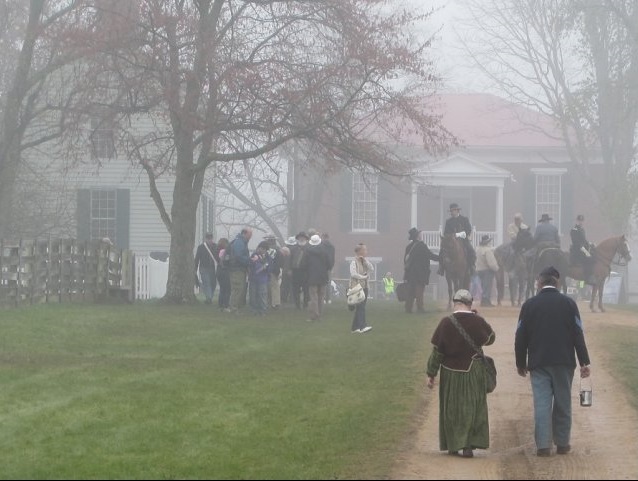 We looked at all the buildings, ate some truly awful food (the one thing I’ll ding Appomattox on: out of the dozens of Civil War and War of 1812 events I’d attended over the past couple of years, Appomattox had the worst food vendors by far), and visited with reenactors. 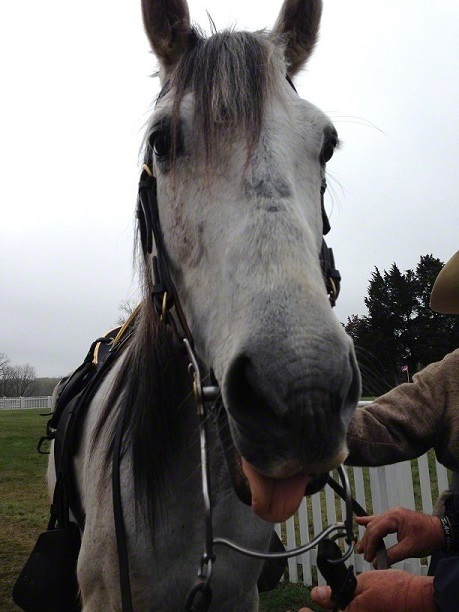 This is Zeus, who was playing Traveler, Robert E. Lee’s horse. He was showing me how he felt about having his photo taken. The star of the village is the McLean House, where Confederate General Robert E. Lee surrendered his Army of Northern Virginia to Union General Ulysses S. Grant. It’s a reconstruction/restoration hybrid. Built in 1848, it was dismantled in 1893 to take to Chicago to be displayed at the World’s Fair. It was then to be reconstructed in DC and used as a museum. All that never happened. In 1948, it was reconstructed on its original site at Appomattox. Makes me wonder where it was between 1893 and 1948. Yes, I spend my time thinking about stuff like that. 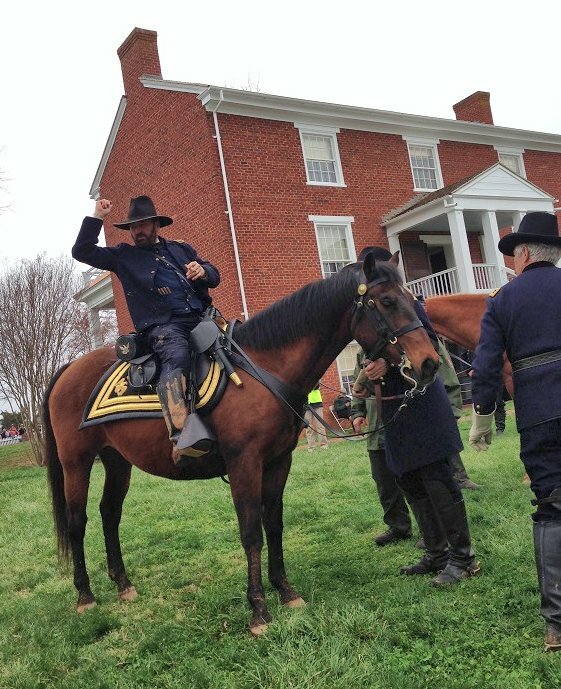 That’s General Grant, behind the McLean House. He was working the crowd, after the signing. No photographs are allowed inside but that’s no huge loss because the furnishings aren’t original to the house. The Union soldiers who were with Grant at the surrender signing (Lee had one aide with him; Grant had 13, including President Lincoln’s son Robert) took everything they could from the room, as souvenirs. Some of them “bought” the items from house owner Wilmer McLean by handing him money for them. But it was an involuntary transaction because McLean didn’t want to sell the items. Others simply stole the items. Silent Witness was taken by Union Captain Thomas Moore and remained with his family until 1992, when they donated it to the Appomattox National Historical Park. Forever separated from Lulu McLean, today she lives alone in the park’s museum. 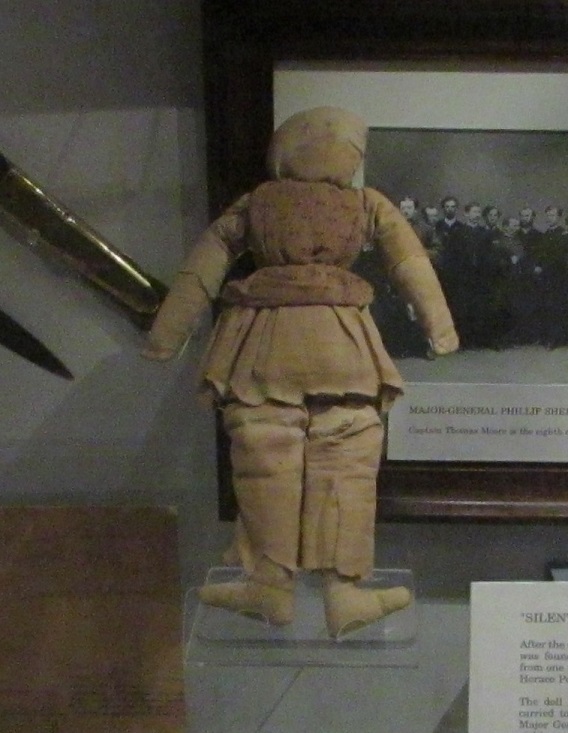 Gallery | This entry was posted in Virginia and tagged Appomattox Court House, McLean House, Silent Witness doll. Bookmark the permalink. Appomattox doesn’t usually have food available. They had one food truck and two vendors at tables, there just for the special event. I do have other restaurant recommendations in the area, though, so let me know when you’re ready to hear them. You’re coming to Virginia? Anywhere near the DC area? If you do, let me know. We are thinking that we will be coming to VA in the fall. Jon and I alternate choosing our big trip each year and I wanted to go to VA last year, but it got pre-empted by the Southwest trip when Jon’s cousin announced his wedding in LA. I haven’t done any planning on route yet, or length of the trip, but when I start, I will certainly pick your brain!